These Easter nests will have you feeling the Easter spirit in no time! With 2 simple ingredients and no cooking needed, they’re the perfect treat for Easter. 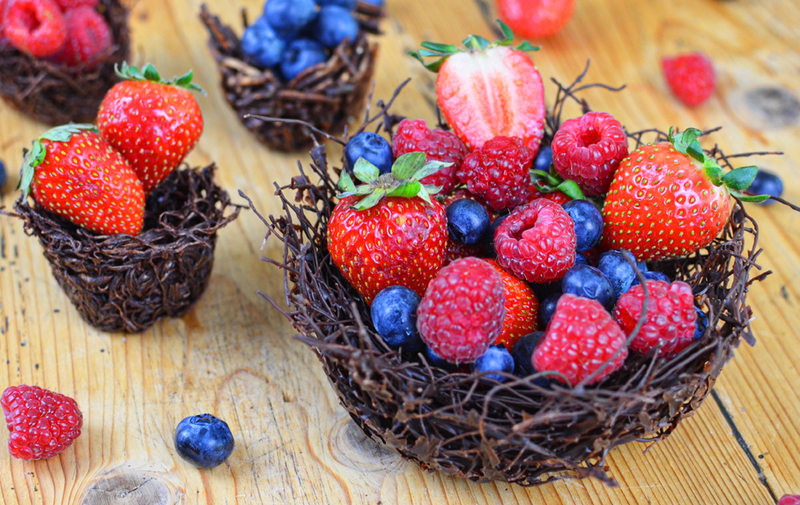 Even get the kids involved by decorating the nests with fresh fruit! 1. Place your noodles/shredded pastry in a large bowl, making sure to separate any large clumps. 2. Prepare a 12-hole, 1/3 cup capacity muffin tray by lining each hole with cling film (I like to use silicon trays as it is easier to pop out the nests once set). 3. Break the chocolate into small pieces and place in a separate microwave safe bowl. 4. Set the power level to approx. 80% and heat at 30 second bursts, ensuring you stir the chocolate in between until all chocolate is smooth and melted. 6. Once the noodles are thoroughly coated, divide the mixture into the prepared muffin tray, ensuring that you have enough of a base and sides. (You’ll need to work fast if it is a cold day as the chocolate will begin to set). 7. 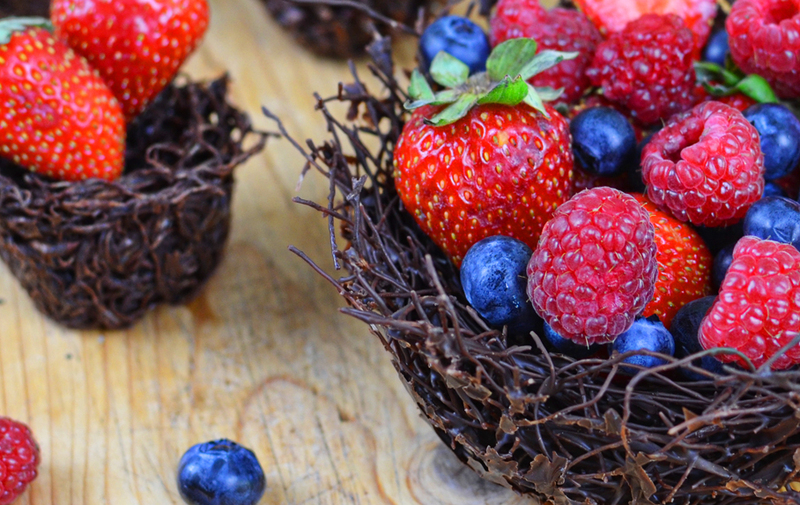 Place nests in the fridge until set before removing from the trays and topping with your favourite fruits. 100 grams of 70% cacao contains on average 28.1 grams of sugar. To reduce the sugar content of the Easter nests, switch to Lindt 85% cacao which has 13.7 grams of sugar per 100 grams or Green & Black’s organic dark chocolate (made by Cadbury) which is even lower at 13.1 grams per 100 grams. 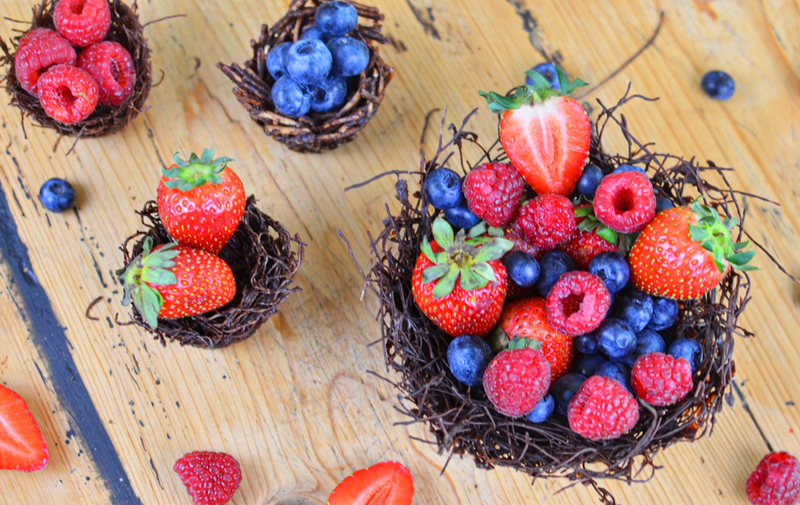 You can use 2 different ingredients to construct these yummy little nests. The alternatives are: 200 grams Chang’s Original Fried Noodles or 150 grams kataifi, cut to approx. 10cm lengths (kataifi is a shredded pastry, you’ll find it in the fridge section of any large supermarket or delicatessen).